I love this bento! Super cute froggies and carrot stars! Oh, it is so nice to read when a food or spice has story to tell, I value it a lot =). I believe the pork belly is heavens delish! Wonderful froggies. Unfortunately, today's bento is not so good as yours (and it will never be ha ha). Thanks for talking about my pink October bento event, I hope a lot of people will join! Aw, lovely froggies! Wish you and family a great weekend too! Your frogs are so cute, I love all the details you put into you bento box lunches! Have yourself a wonderful weekend. Hi salam kenal ! soooo amazed looking at ur creatives bentos !! do u happen to receive orders ? or u only make it for your kids school lunch ? anyhow, so nice looking at ur cuties ! Cheers !!! I want one too! So adorable and what is the green part of the frog? It's perfect!! Those frogs are sooooo cute!!!! I am sure big A will be happy ^_^ it makes me smile just seeing the picture. @Just a MOM : Thanks a lot Lin! Oh yah sure you can use it on chicken too. If I can send it to you, I will. But unfortunately some countries have rules for sending food items. Australia is one of them, so I can't send the spices to her. @Chantale : Thanks a lot Chantale! Sometimes the simple and quick bento is fun to make but hard too snap the picture of it LOL :D Have fun this weekend with your family too! 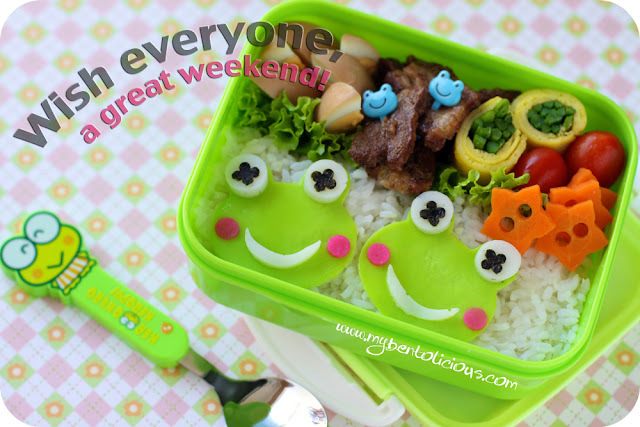 Ver y cute froggies bento,may I know what do you made for the greeny frog?And the recipe of the 5 spice egg really good,I will try this recipe next time. What cheerful froggies! ^^ and woah, the secret 5 spices sound good! oops, sorry i didn't comment on this one until now! such a nice story about the 5 spices... i love childhood culinary memories like that! the stars in this one are so cute, they look like perfect buttons! can i borrow some for my sweater, hehe?